After an email Subscriber subscribes to your email list from a particular email list page, then, you can redirect them to your desired page. The redirected page can be your goal page, thank you page or simply your own homepage. 1. From EasySendy Drip (or EasySendy Pro) Dashboard, goto Email List > Select an email list where you want to add the redirect page upon email subscription. 2. Select “Pages” from the email list dashboard. 3. Inside Pages, from top right, click on drop down button – “Select another list page to edit” and select third option “Subscription confirmed”. 4. 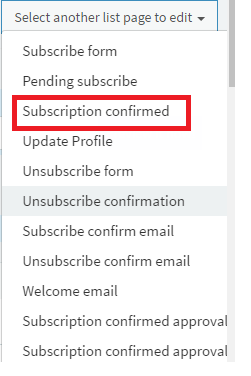 On new “Mail list Subscription confirmed” page, scroll the page to bottom. And, last option, you will find “Instead of the above message, redirect the subscriber to the following url:“, there you can add you desired page URL, where you want to redirect the email subscriber after their email submission. Finally save these settings of the email list.